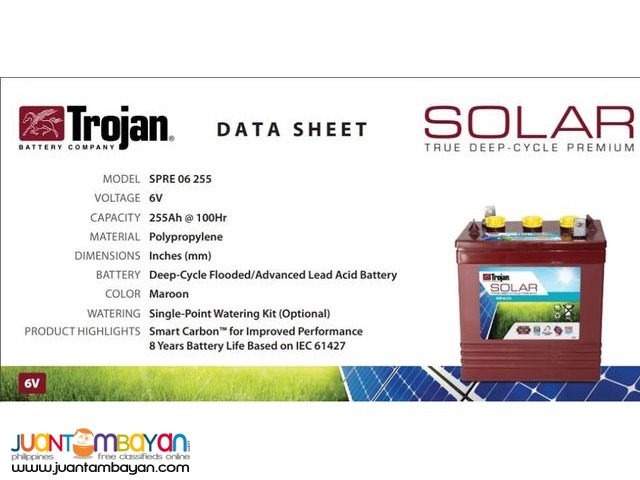 TROJAN SOLAR PREMIUM BATTERIES AVAILABLE. •Alpha Plus® Paste with T2 Technology™ which optimizes porosity development in the active material enabling the active material to be used more effectively. This results in sustained battery performance over a longer period of time. •DuraGrid™ Design provides a thick grid structure that resists corrosion, and when combined with the Alpha Plus Paste with T2 technology, increases overall battery life. •Maxguard® XL Separator is exclusively available in Trojan’s Premium and Industrial lines. It features a wide-channel design which increases acid flow for optimum battery performance, and provides even greater resistance to stratification, a typical mode of failure in batteries used in renewable energy systems. •The Polyon™ container is Trojan’s ultra-rugged case design which protects against damage caused by harsh environmental conditions, such as moisture and dirt buildup, and safeguards against potential acid leaks.